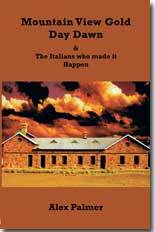 You are invited to the launch of Alex Palmer’s new book Mountain View Gold Day Dawn & The Italians who made it Happen. Alex, a local author, has written eight books about the Goldfields and is dedicated to preserving the precious history of the area. This book tells the story of how a group of Italian prospectors at Day Dawn persevered for four long years in intolerable conditions and finally struck it rich. Alex’s book will be launched by Mayor Logan Howlett and will be available for purchase at $20 (cash only). Free refreshments. *Where did you hear about this event/program?